Update Wednesday February 10th 10pm. WE'VE HIT OUR $10,000 GOAL! Thanks to the Portland Independent Chamber of Commerce (#PICOC) for your efforts this past week to raise an additional $9000+ for the project to upgrade this Lodge food cart site. We now have enough funding to make all the planned improvements, some additional upgrades and have a small contingency fund. We've hit our $7000 goal! Thanks so much to Portland Independent Chamber of Commerce (PICOC), individual PICOC members and all of you who heard about this project via PICOC's efforts. We are going to raise our goal one more time to $10,000. There are many site improvements we never considered due to lack of funding--we can use new benches, tables and chairs because our current inventory has been in the elements for four years. Significant lighting throughout the site is another add-on which will make the site and the Lodge more prosperous. The Sons of Haiti Lodge is one of the last black-owned properties on historic Mississippi Avenue in North Portland. The Lodge is the home for two social service organizations--a Masonic Lodge and Sisterhood of Eastern Stars. 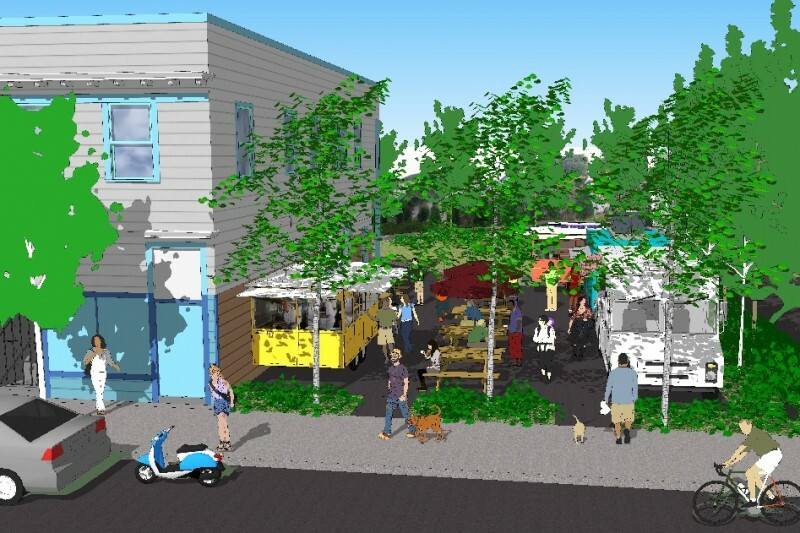 The Lodge membership ran into a major challenge with the City of Portland regarding their food cart site being non-building code compliant and accrued significant fines. The Lodge doesn’t have the resources to upgrade the site as required by the city so Lodge members asked the Boise Neighborhood Association (BNA) for help. The good news is several BNA board members and business owners on Mississippi Avenue collaborated to help the Lodge over the last six months--they developed and funded a plan to renovate the site in compliance with city code. Major funding for the project has been provided by the Portland Development Commission. Additional funding has been provided by generous Mississippi Avenue business owners and area residents. The project started January 25th with completion expected March 1st. When finished this project will provide the Lodge with signficantly increased revenue opportunity from the food carts. The Lodge still needs your financial support. Additional plumbing improvements were cited by a city inspector incremental to the original project requirements. We also want to fund improvements not required by the City but truly necessary to improve the site--new sidewalks and lighting for the new food cart site. Recent media coverage in The Skanner here. The Sons of Haiti Lodge (known formally as “M.W. St. Joseph’s Grand Lodge”) is a 501(c)3 non-profit (Federal Tax ID # 93-0885107). WE'VE HIT OUR $10,000 GOAL! Thanks to the Portland Independent Chamber of Commerce (#PICOC) for your efforts this past week to raise an additional $9000+ for this project to upgrade the Lodge food cart site. We now have enough funding to make all the planned improvements, some additional upgrades and have a small contingency fund.